U.S. Secretary of State John Kerry departed Sunday on a trip to the Middle East that will focus on the Syrian civil war and multinational efforts for a political transition in Damascus, as well as ongoing violence between Israel and the Palestinians. U.S. officials announced late Saturday that Kerry will be traveling to the United Arab Emirates and Israel. Kerry will be in Abu Dhabi, Tel Aviv, Jerusalem and Ramallah for talks with officials including Israeli Prime Minister Benjamin Netanyahu and Palestinian leader Mahmoud Abbas. The top U.S. diplomat said earlier this week he is hopeful that a conference can be convened within weeks to include Syria’s diverse opposition groups as part of a broad plan for a political transition in the country. “We are now at a stage where the opposition is coming together to choose those people who will negotiate for it,” Kerry said. FILE - Russia's Foreign Minister Sergei Lavrov, top right, U.S. Secretary of State John Kerry, top center, and other foreign ministers attend a meeting in Vienna, Austria, Nov. 14, 2015, to find a way to resolve the conflict in Syria. The most recent round of talks on Syria by the United States and other world powers concluded in Vienna on November 13 with a pledge to try to bring both Syrian government and opposition representatives into U.N.-mediated talks by January. “Ultimately, this has to be a Syrian-owned process and any kind of political transition has to be a Syrian-led process,” says Middle East analyst Perry Cammack of the Carnegie Endowment for International Peace. Kerry travels first to the United Arab Emirates, which has been participating in the multiparty Vienna talks. The UAE is also part of the U.S.-led coalition that has been launching airstrikes against Islamic State militants in Iraq and Syria. The effort to contain and suppress Islamic State extremists is another likely focal point of Kerry’s Middle East talks. Kerry’s visit to Israel comes at a time of heightened tensions between Israel and the Palestinians. 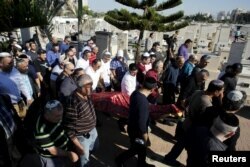 At least 80 Palestinians and 18 Israelis have been killed in the spiraling unrest that began in October. Many of the Israelis have been victims of Palestinian stabbing attacks. Palestinians have been angered over what they view as Jewish encroachment on a holy site in Jerusalem that is sacred to both Muslims and Jews. FILE - The body of Reuven Aviram, 51, one of two people killed Nov. 19 in a Palestinian stabbing attack in Tel Aviv, is carried by friends and relatives during his funeral in Ramle, Israel, Nov. 20, 2015. Palestinians were further angered by an Israeli government decision this week to allow more settlement construction on occupied land. "We want to see bigger changes on the ground to try to get the situation stabilized in a more sustainable way,” a senior State Department official said in a background briefing on Saturday. “A variety of different ideas have been talked about, all with the purpose of trying to stop the violence and restore calm in a sustainable way,” the official said. During his meetings with Palestinian leader Abbas, Kerry is expected to discuss measures that could improve the situation, and U.S. officials said he will urge both sides to exercise restraint. That could be a tall order for Kerry, according to Brookings Institution Middle East analyst Khaled Elgindy. “It is definitely the case the case that the United States has much less sway with both sides, certainly with Israel but even not much influence with the Palestinian leadership,” he said. Kerry’s trip to Israel will be his first in over a year. It comes on the heels of Israeli Prime Minister Benjamin Netanyahu’s Washington visit, this month, which included a meeting with President Barack Obama. FILE - U.S. President Barack Obama and Israeli Prime Minister Benjamin Netanyahu shake hands during their meeting in the Oval Office of the White House in Washington, Nov. 9, 2015. The U.S. and Israel have been trying to mend fences following Israel’s bitter opposition to the Iran nuclear deal. In Washington, Netanyahu noted the U.S and Israel had disagreements over Iran but said there was no disagreement about what needs to be done going forward. “Number one: Hold Iran’s feet to the fire. Make sure they abide by their obligations. 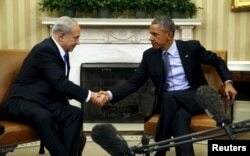 Two: work to block Iran’s aggression and terror in the region,” Netanyahu said. While in Israel, Kerry is also likely to discuss ways to lower spiraling tensions between Israelis and Palestinians, which have resulted in the deaths of at least 15 Israelis and over 80 Palestinians in the last two months. Kerry’s trip to Israel also comes soon after Jonathan Pollard, convicted of spying for Israel, was released from prison after 30 years. Pollard, a 61-year-old former analyst for the U.S. Navy Investigative Service, was released on parole from his life sentence, on the condition that he remain in the United States. Netanyahu has called for Pollard to be moved to Israel. The White House has said it does not intend to alter the copnditions of his parole. Convicted spy Jonathan Pollard and his wife, Esther leave the U.S. federal courthouse in New York, Nov. 20, 2015.